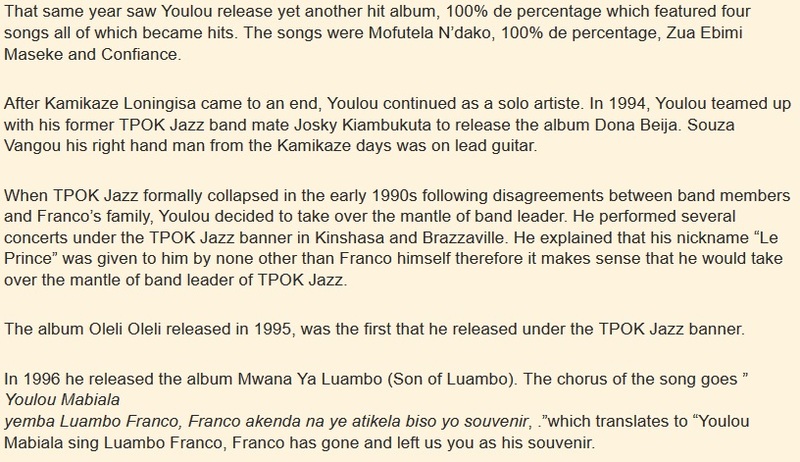 Motema na ngai television, 100% de percentage, Loufou Lakari,Infraction, Le Verdict, Mwana Ya Luambo, UCB, Bantous De La Capitale, Josky Kiambukuta. Mama Leni, Helen Luambo, Vicky Longomba, Celi Bitchou, Loko Masengo, Mose Se Fan Fan and Michel Boyibanda. , Brazaville music, Sassou Nguesso, nzonzing, Verkys, “Souza Vangou”, Serge Kiambukuta, 100% de percentage, Zua Ebimi Maseke and Confiance. 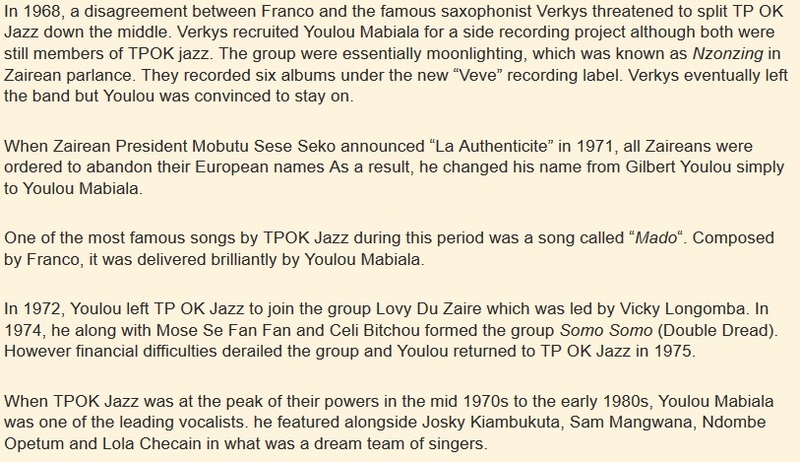 This entry was posted in African musicians and tagged Celi Bitschou, TPOK jazz members, TPOK jazz Musicians, Youlou Mabiala. Bookmark the permalink. 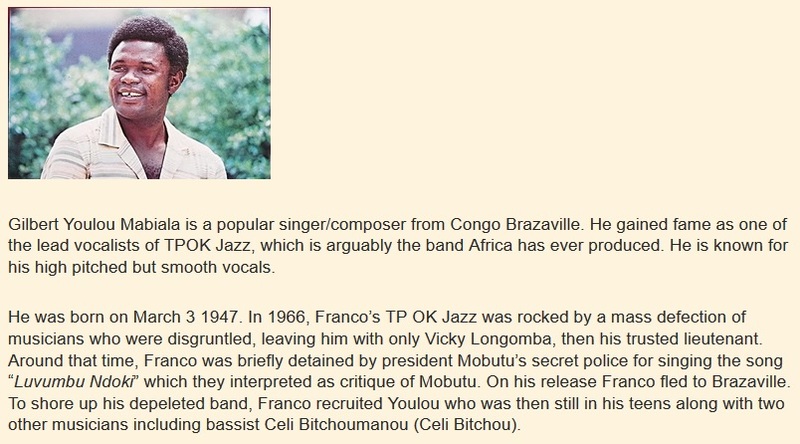 Wow Mabiala is one of my best in o.k jazz,his wonderful voice is soothing to my heart,i feel so young wen Youlou is a chanter,though i’m 26yrs but missing u live on stage.Wishing quick recovery to Youlou.Writting from Nairobi Kenya. 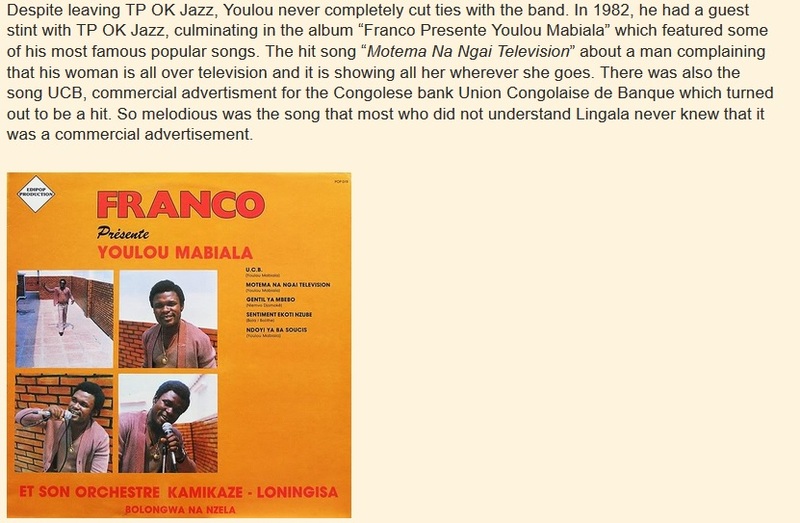 Mabalia Gillbert Youlou was amongst others, Sam Manguana, Mose Fan Fan, Kiamangana Mateta, Josky Kiambukuta, Dombe Opetum, Dr. Nicko, Bavo Marie Marie, Soki Vangu, Tabuley Roucherou and Franco Luambo himself the best musicians i love with all my heart. It was difficult to determine wich among these artistes was the best. But I know the best of best among these gifted artistes was just all of them.